On her way into port Ian Shiffman was on hand to capture the moment. Unlike her neighbour Belgium (see recent report on Belgian Navy ship visit to Angola and Cape Town), The Netherlands has a long and proud history as a seafaring nation and boasts a navy that carries quite a powerful punch. 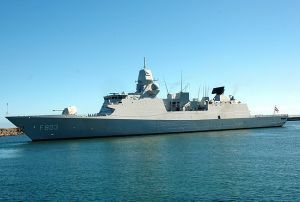 One of its latest ships, TROMP is by her size and role more correctly regarded as a destroyer despite being officially classified as a frigate. The ship displaces 6,044 tonnes fully loaded and has a length of 144m. Powered by two diesel engines with the expected boost of twin turbines driving twin shafts, she is reported to have a speed of around 30 knots through the water. In keeping with modern design thinking, the ship carries a low radar and heat signature. TROMP’s armaments consist of a large array of missiles, with a single gun on the foredeck and several lighter guns plus four torpedo tubes. She is equipped to carry two helicopters and has a crew of 220.